The effects of automation aren’t just being debated in academic circles. They’re already being felt by working people, and they’re part of what’s fuelling the rise of the right in the United States and Europe. Studies suggest that nearly half of all jobs in the United States, the United Kingdom, and Germany could be automated; and White House economists have forecasted that workers earning less than $20 an hour face an 83% chance of losing their jobs to automation. But this isn’t something that’s going to happen in the far future. 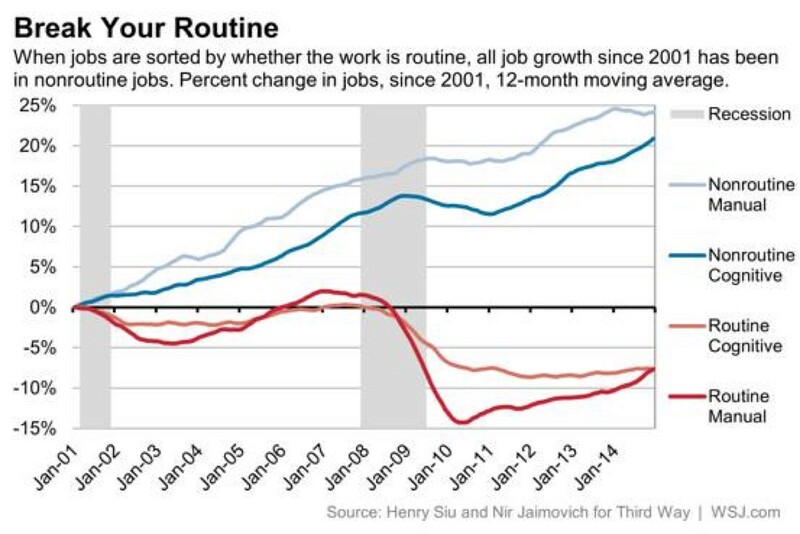 Researchers Henry Siu and Nir Jaimovich tracked job growth since 2001 and found that only nonroutine forms of work have been growing, while routine jobs were stagnating, but have been getting cut significantly since the recession. This should be worrying because it represents the beginning of the effects of automation, and while routine workers are getting hit first, technology will replace many of those in nonroutine jobs, as well. As people lose their jobs, they become scared. Our societies are built on an economic system where an income is essential to survival, and the vast majority of people can only earn that income through wage labour. When jobs begin to disappear, and there’s little support for those being made redundant, they become scared and desperate. That desperation then leads them to support liars like Donald Trump and Brexit campaigners who cloak their self-serving rhetoric in promises of support, even though their plans will only benefit the wealthy. In reaction to the growing fears about mass unemployment fuelled by automation, the political class has adopted a twentieth-century labour fetishism that transcends ideological lines. Both the left and right are promising the masses they’ll bring back the disappearing jobs, and kick out “others” who are stealing those jobs, but these promises will be broken. People are losing trust in politicians and experts because they’ve seen how this story plays out time and time again. They’re promised support, but that aid never materializes. They know that the dominant political forces of the centre have allowed economic decisions to be made in a such a way that the wealthy always benefit, while everyone else suffers. And that’s why they’re turning to the extremes. The fear that average people are experiencing as their incomes stagnate or disappear will not be addressed by job creation tax credits or limited infrastructure spending. Instead of trying to force people back into full-time work, we should be encouraging automation to reduce the burden of work that we place on humanity. However, this will never be possible while people are scared and feel their survival is at risk. The only way we can give people the mental space to contemplate a transition to a new economic model is to remove that fear by ensuring they have the money they need to cover the basics. 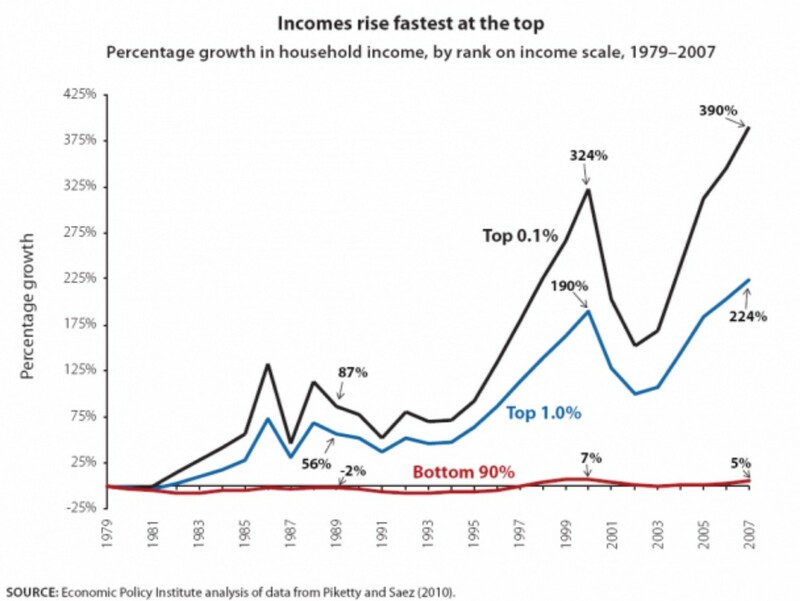 If we’re to have a serious and broad discussion about utilizing automation to significantly reduce working hours, and building an economy where everyone benefits from technological progress – not just the top 1% – then income scarcity must be addressed by ensuring people have the money they need to cover the basics, regardless of whether they have a job. A basic income could solve this issue overnight. The policy would provide an unconditional income to every citizen, regardless of their current income or whether they have a job. It would free them to think more long-term, both about their individual desires, and what they think would be the best path forward for their communities and societies. 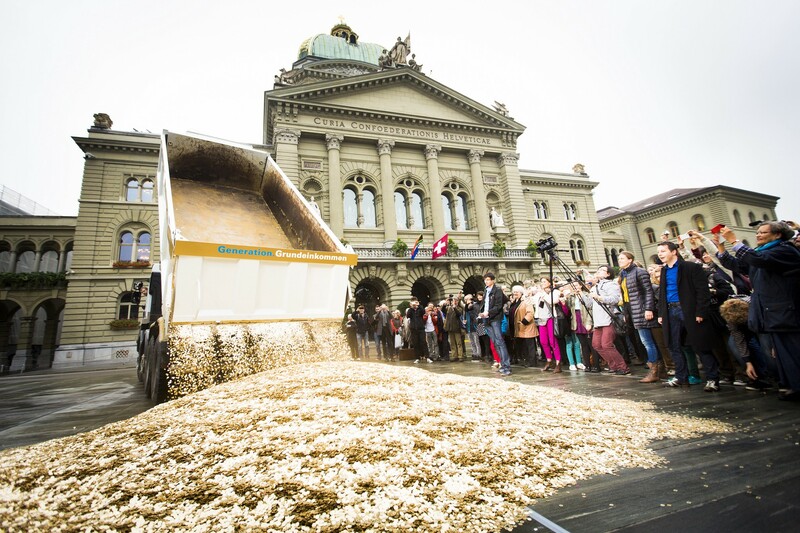 This isn’t to say that the basic income should be seen as a replacement for the welfare state. It should be accompanied by a system of universal social supports, including health care and education, and should be pegged to cost-of-living so that as we move away from a society where everything has a price, the basic income is reduced to reflect the new reality. Instead of fighting to hold onto undesirable jobs and a wage labour structure that puts the masses at the service of the wealthy few, a basic income would give people the freedom from income scarcity they need to contemplate the future they want for themselves and their children, and it’s hard to imagine that would involve the exploitative form of capitalism that has kept them down for so long. 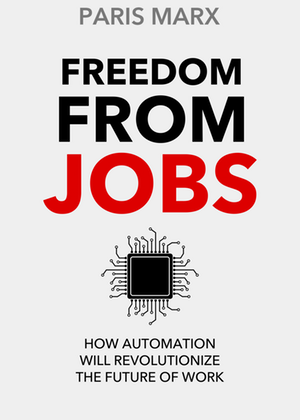 Freedom From Jobs identifies the problems with our current economic system, how automation is already impacting the way we work, and presents a vision for the future that would liberate the masses from the exploitative toil of wage labour. Available now on Amazon, iBooks, or Kobo. Paris Marx is the author of A Music Industry for the 99%, Dystopia or Utopia?, and Freedom From Jobs. He writes about the growing divide within the capitalist system, movements for alternative forms of economic organization, and ways of living that challenge traditional narratives.